During my exchange in Hong Kong 6 months back, I came across a peculiar sight when I visited the Hong Kong Island region. There were trees on the walls! Tall, massive ones attached to the retaining stone walls! Though I was curious back then, I did not ponder it for too long, as I was distracted by the other delights that Hong Kong could offer. However, when these trees were brought up during the Urban Ecology lecture on urban vegetation, my curiosity was aroused once more. So, join me as I uncover more about this fascinating phenomenon! First and foremost, what is a stonewall tree? Here is an example of a row of stonewall trees in Hong Kong! The trees that live on these walls belong to the genus Ficus,i.e., fig trees2. The most common one is the Chinese Banyan (F. microcarpa)2. The figs that dominate the walls have adaptations to strangling behaviour. In their natural tropical rainforest habitat, their life cycle begins when frugivorous bats and birds deposit droppings containing seeds onto upper branches of other trees, and some germinate3. The seedling starts off as an epiphyte that needs the host tree for a substrate2. Over time, if it has enough resources, the strangler fig will divert its energy to propagating and elongating its aerial roots toward the forest floor2. Eventually, it develops an extensive root system in the soil2. Now that they’ve got a reliable and enhanced root system, the trees can grow quickly and become massive2. Eventually, the aerial roots around the trunk of the host tree thicken and lignify, exerting a strong force, while the host tree exerts an opposite one. The two opposing forces create so much pressure that they literally strangle the host (that’s how they get their name! ), depriving it of water and nutrients, to the point that it dies. A quintessential parasite. A strangler fig in its natural tropical rainforest habitat in Hong Kong! Back to the stone walls. Basically, the strangler figs substitute the wall for a host tree2. Seeds are deposited in or on the wall2. Of the small fraction that manages to germinate under harsh urban conditions and develop into epiphytes, the natural strangler habit helps their roots penetrate the gaps and joints to reach the soil in the wall core or behind the wall2. This soil allows roots to proliferate, increasing nutrient intake and anchoring the tree2. The lignified aerial roots also interact with the tree’s own branches and trunk to form sturdy and tightly bound networks of root stands and props to support the massive structure2. All in all, strangler figs are pre-adapted to flourish on stone walls. 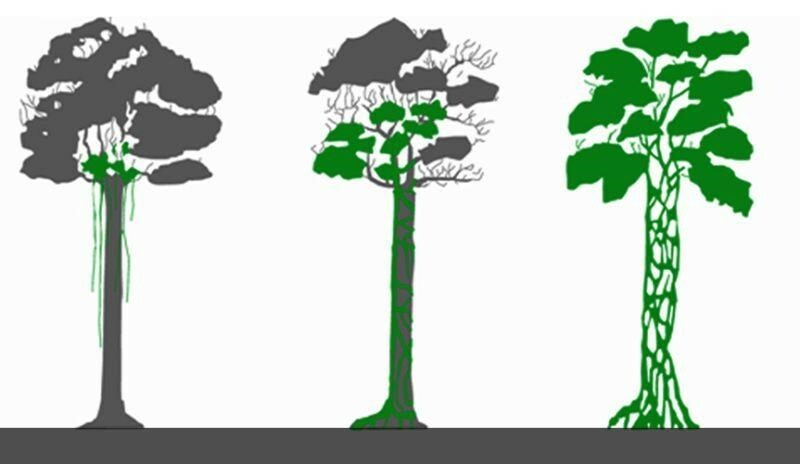 So why are these trees important? Hong Kong’s wall trees are considered precious and unique natural assets, exemplifying the harmonious co-existence of culture and nature in an urban environment5. They are also historically important. Some were established in the early 19th century on some of the oldest stone walls4. With traditional masonry wall construction no longer in practice, current threats to demolish and modify these walls further increase the unique historical value of these trees5. Furthermore, local communities have an attachment to these trees, which they grew up with5, and benefit from the ecosystem services they provide2. Clearly, these trees enhance the urban landscape quality and enrich biodiversity in Hong Kong2. Check out the designs of these masonry walls! Some of these trees fail, often when they are uprooted during severe weather events2. For example, in July, 2015, a banyan tree on Bonham street was uprooted and crashed down onto the street, damaging surrounding infrastructure and injuring 2 people7. The video below shows the process of it happening. This incident prompted the Highway Department (HyD) to inspect and manage the conditions of other five trees on this street8. Initially, HyD decided to remove one tree in poor condition and prune the other four8. But just two weeks later, HyD officials decided to remove all the remaining banyan trees, and by the next morning, all four century-old trees were gone9. The official statement released by the HyD stated that they found signs of the walls weakening, which posed a risk of imminent tree collapse and a threat to public safety8. This decision ignored recommendations from experts6, including from Civil Engineering and Development Department, which found no evidence of instability 10. In the aftermath of this event, the local community mourned the loss of the banyans, expressing their feelings by posting notes and attaching balloons to the roots or stumps or whatever was left of the trees. The decision and handling of this incident by the Government lack transparency. Proper explanations should be given. If there were any potential risk to public safety due to the walls or the trees, then the Government should have conducted and publicised a tree and wall evaluation report to justify their actions. The Government should engage the public and experts for consultation. Even though a panel of experts was consulted, the relevant authorities ignored findings that the remaining four trees pose no danger6. The public was not consulted despite its affinity for the trees. 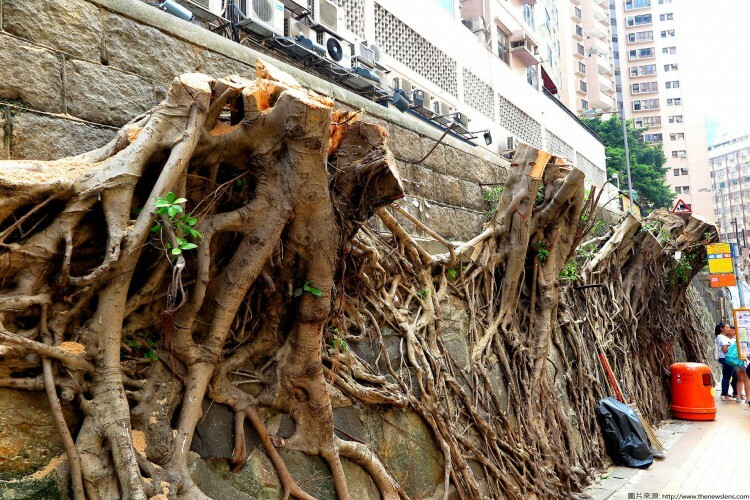 The Government should formulate a comprehensive conservation guideline or plan to protect and conserve the wall trees in Hong Kong, and give experts a greater say. Public education is key in raising awareness and appreciation of the natural and historical significance of the trees. The public should be thoroughly briefed on who to contact when they spot an issue with the trees. Increased monitoring should be used to ensure that walls are sturdy enough to support the trees, and trees should be maintained so that their weight is not excessive. While scouring for more information on stonewall trees, I stumbled on and became embroiled in the controversy of Hong Kong government’s actions involving the stonewall trees. It became clear to me that there is a government-public disconnect, in that the authorities did not consult the local community. But the government argued that it was acting in the interests of public safety, and not in the interests of public preferences6. A question to ask is: are we wrong to criticise the government’s mentality that prevention is better than cure, even at the expense of conservation? If so, then what is the best course of action? 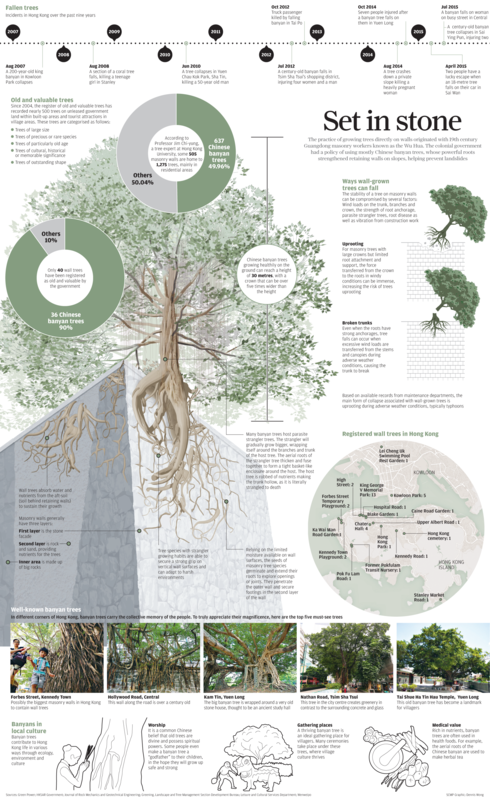 For more information about stonewall trees, do check out this infographic! 1Jim, C.Y. (1998). 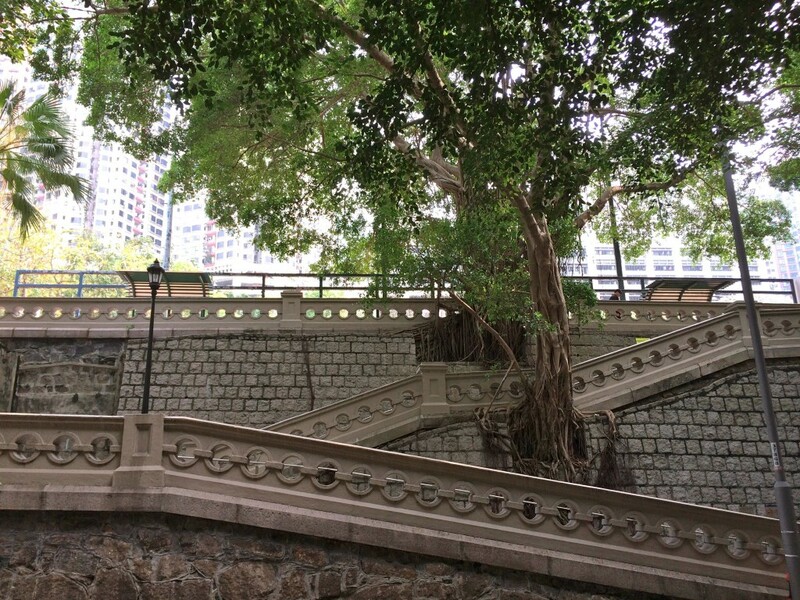 Old stone walls as an ecological habitat for urban trees in Hong Kong. 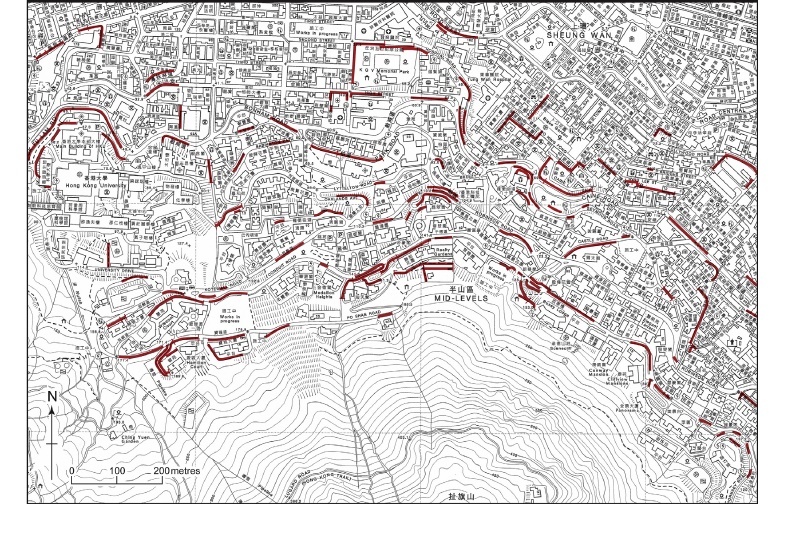 Landscape and Urban Planning 42(1): 29-43. 3Jim, C. Y. (2014). Ecology and conservation of strangler figs in urban wall habitats. Urban Ecosystems, 17(2), 405-426. 4Lo, A. Y., & Jim, C. Y. (2015). Community attachment and resident attitude toward old masonry walls and associated trees in urban Hong Kong. Cities, 42, 130-141. 6Time Out Hong Kong. (2016). 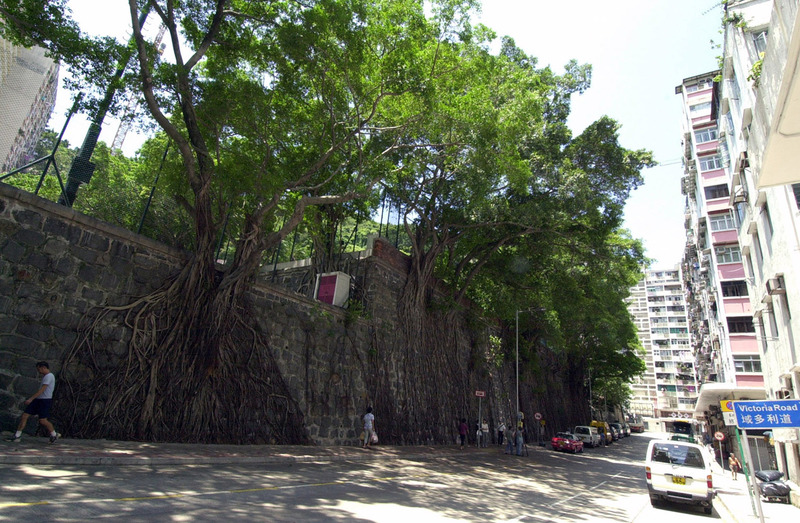 Should Hong Kong’s century-old stonewall trees be removed?. 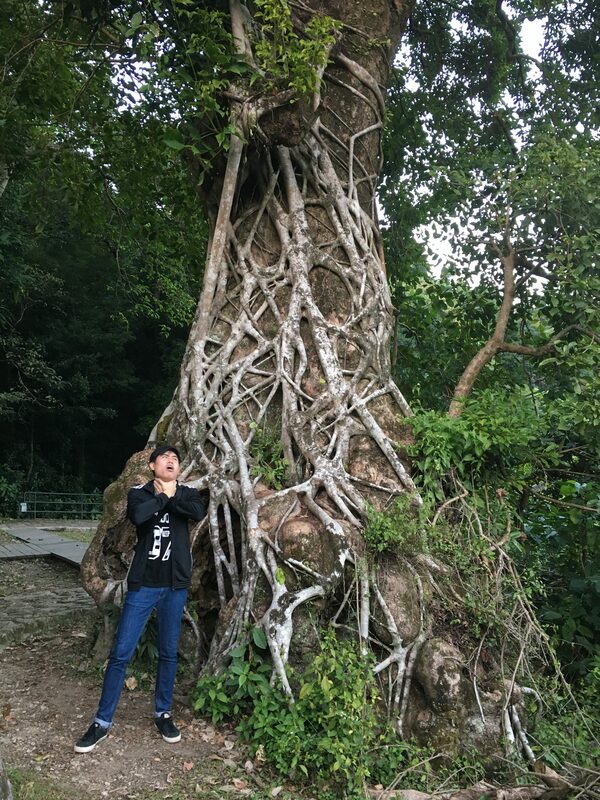 Retrieved from http://timeout-admin-node1.candrholdings.com/big-smog/features/75801/should-hong-kongs-century-old-stonewall-trees-be-removed.html#panel-2. 7Kilpatrick, R. (2015). 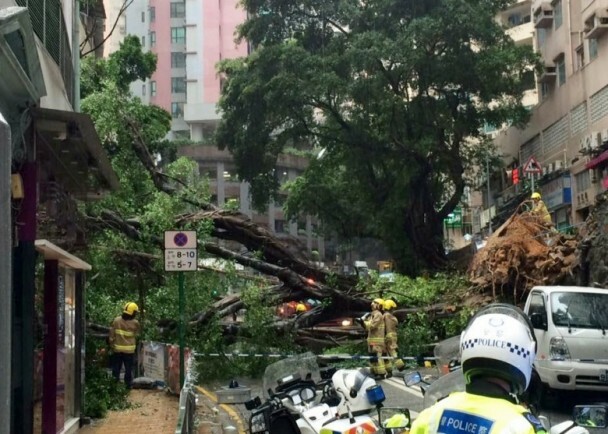 Video: The moment Hong Kong’s biggest ‘wall tree’ came crashing down. Hong Kong Free Press. Retrieved from https://www.hongkongfp.com/2015/07/22/two-injured-as-hong-kongs-tallest-stone-wall-tree-comes-crashing-down/. 8Wong, V. (2015). Bonham Road Banyan trees removed after cracks in stone wall appear. Hong Kong Free Press. Retrieved from https://www.hongkongfp.com/2015/08/08/bonham-road-banyan-trees-removed-after-cracks-in-stone-wall-appear/. 10Bauhinia Foundation Research Centre. (2015). Cutting down of stonewall trees causes controversy on tree management policy. Retrieved from http://www.bauhinia.org/index.php/english/analyses/361. Reservoirs comprise a significant component of Singapore’s urban freshwater habitats. In fact, they have been found to have greater diversity of freshwater mollusc species as compared to forest streams, ponds and monsoon canals (Clements et al., 2006). During the briefing session before we set off, participants were educated on the impacts of litter on aquatic organisms. We were told that litter, such as aluminium cans, form a surface for the eggs of the golden apple snail, Pomacea canaliculata, to be stuck in. The eggs hatch inside the cans, and when the snails get bigger they are unable to escape and eventually die inside. We were all urged to pick up any cans we find, give them a rattle to see if there are any trapped golden apple snails, and then cut up the cans to free the snails. This then sparked a discussion on whether we should actively save invasive species. The golden apple snail was introduced into Singapore most likely because of the pet trade (Yeo & Chia, 2010) and has now exploded in numbers in many reservoirs, ponds and drains across Singapore (Tan et al., 2013). It is listed as one of the world’s 100 most invasive species (Lowe et al., 2000). If you have ever seen clumps of tiny pink round balls sticking to the sides of river banks, those are the eggs of the golden apple snail! Since the introduction of the golden apple snail, the abundance of the native snail, Pila scutata declined rapidly, which might be due to the presence of the invasive apple snail (Chan, 1996; Tan et al., 2012). So back to the question. Are invasive species in general worthy of saving? Perhaps the creation of non-native habitats such as reservoirs made these alien animals ‘native’ to that kind of habitat? If so, then they might be considered native in that context. Or maybe it is more of a morality issue, i.e., we should help any animal in peril regardless of the damage it does to the ecosystem. As we went on our kayaking adventure, we did not find any apple snail-containing cans, but we were shocked by how much rubbish we saw floating on the water surface and half-submerged. I had always thought that Singapore’s waterways are clean, especially the reservoirs where we also obtain our drinking water from. But this journey brought us closer to the litter that is hidden from the sight of most park users. We learnt that trash gets into our waterways via different paths, such as being blown in from land or carried in pipes that discharge water into the river. As I was gliding across the river with my partner and trying to spot litter, I realised that riparian vegetation actually traps quite a lot of trash, making it difficult to remove. Thus, by accumulating trash, riparian vegetation could have made our waterways dirtier. Even so, we cannot deny the benefits that these plants bring, as they help to reduce erosion and provide breeding grounds and shelter for otters and birds (NParks, 2009). Another realisation I made was that most of the time, we only pick up visible litter, but upon closer inspection, I saw a lot of submerged trash – it would normally get missed. This litter, including plastic bags and straws, can pose a huge threat to wildlife. For example, WWS volunteers told us about the many times when they had to free fish stuck in plastic bags. I learnt that even though paid contractors and WWS volunteers regularly clean up the Kallang River, the volume of rubbish never seems to dwindle. At the end of our 40-minute session of kayak clean-up, the total weight of rubbish we all collected totalled 16 kg. 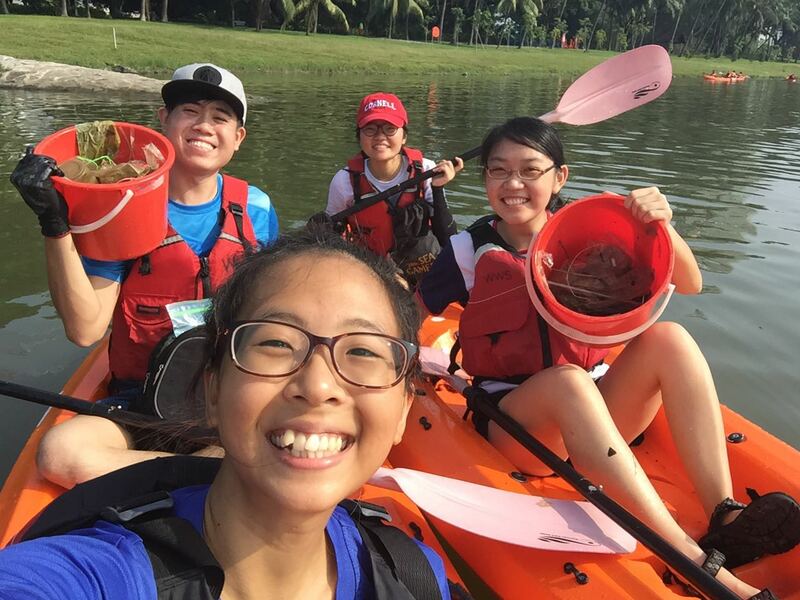 That might not seem like much, but we were told that contractors collect about 10 tonnes of trash from the Kallang River every day! It is undeniable that waterways in and near cities will tend to have greater pollution as compared to those in the forest. But modified habitats, such as our canals and reservoirs, are increasingly becoming important sites for native biota, such as the famous smooth coated otters, Lutrogale perspicillata, whose return signifies cleaner waterways in Singapore (BBC News, 2016). Therefore, I believe that one method to ensure the integrity of our urban freshwater ecosystem and possibly boost species richness is to maintain litter-free habitats. So, for this World Water Day, apart from reinforcing our water-saving habits, let us remember not to litter and to pick up any trash we find near waterbodies, so they do not get washed or blown into our rivers and reservoirs! You might recognise some of us in the photo to be from LSM4265! BBC News (2016) Singapore’s celebrity urban otter family. http://www.bbc.com/news/world-asia-36700728 (Accessed 21st March 2017). Chan SY (1996) Some freshwater gastropods of Singapore. Of Sea and Shore, 18: 184–187. Clements R, Koh LP, Lee M, Meier R & Li D (2006) Importance of reservoirs for the conservation of freshwater molluscs in a tropical urban landscape. Biological Conservation, 128(1): 136-146. Crome F, Isaacs J & Moore L (1994) The utility to birds and mammals of remnant riparian vegetation and associated windbreaks in the tropical Queensland uplands. Pacific Conservation Biology, 1(4): 328-343. Lowe S, Browne M, Boudjelas S & De Poorter M (2000) 100 of the World’s Worst Invasive Alien Species, a Selection from the Global Invasive Species Database. Invasive Species Specialist Group (ISSG), a specialist group of the Species Survival Commission (SSC) of the World Conservation Union (IUCN), Auckland, New Zealand, pp. 1–12. Tan SK, Chan SY & Clements GR (2012) A Guide to Snails and Other Non-marine Molluscs of Singapore. Singapore Science Centre, Singapore, 176 pp. Tan SK., Lee YL & Ng TH (2013) The status of the apple snail, Pila scutata (Gastropoda: Ampullariidae) in Singapore. Nature in Singapore, 6: 135-141. Yeo DCJ & Chia CSW (2010) Introduced species in Singapore: An overview. COSMOS, 6: 23–37. Singapore, the Garden City of Asia, boasts its lush greenery and abundant biodiversity. But all is not always as such. The recent toppling of a tembusu tree at the Singapore Botanic Gardens sparked major concern in Singapore when it killed a person and injured four others. This is not the first incident of tree fall that has cost a life or property damage. In fact, these incidents began as early as 2013. This year, the trees came back and vegetation crept closer to my house. 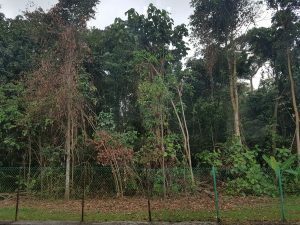 The fall of the tembusu sent my neighbourhood into another email frenzy with the National Parks Board (NParks). They wanted their backyards to be safe spaces. This meant the trimming of trees and the removal of vegetation from the forest. Their unhappiness and persistence of the matter left me in a dilemma between the interest of my neighbourhood and that of the biota in our backyards. My silent dilemma came to an end when a decision was made. Just last week, workers came with their equipment and started sawing down trees in the forest which were within 5 metres of the neighbourhood. The result? A barren forest edge, the loss of heritage trees, a noticeable decrease in bird calls, macaques walking along the fence, and what the neighbourhood wanted: safer backyards. It is interesting to note that macaques have never been seen along the fence, apart from this week. Did the removal of trees disturb their habitat and cause them to move? This issue taught me that the complaints never stop. People perpetually seem to have problems with living with nature. Rarely do they take into account the geographical context of their location. Singapore is located in the vibrant tropics, with a beautiful diversity of plants and animals. We have the North-East monsoon which sends thunderstorms and turbulent winds to our island twice a year. It sways the trees in an exotic dance against the backdrop of falling leaves. This is nature. Perhaps, we should learn to treasure the invaluable biota of our land and not take them for granted. Perhaps, we should first learn about nature and how to approach it before we let our fears decide what is best. Perhaps, we should ask ourselves, are they in our way, or are we in their way? Given the high density and limited space in Singapore, the physical line and distance between humans and wildlife will only be closer and closer. We can choose how to react to it – in anger or appreciation. What will your choice be today? With approximately 40% of urban ecology literature focused on birds, it is of no doubt birds hold a prominent place in urban ecology. As an urban city, Singapore houses many urban birds. As a child, the local urban bird that had the largest impression on me was the house crow (Corvus splendens). In my childlike eyes, they were large and frightening. In an attempt to curb the exploding population of the invasive house crow, the Singapore government has used culling since 1973 (Brook et al., 2003). I actually witnessed one such culling event in my estate. I remember the loud gunshot sounds and being told by my mother that they were shooting the crows. As a young adult now, I realise that I do not notice the house crow as often as before. Instead, everywhere I look on the streets is the ubiquitous myna. However, it may not be widely known among locals that Singapore actually has two species of myna, the common myna (Acridotheres tristis) and the Javan myna (A. javanicus). As a Bachelor of Environmental Studies student, I am embarrassed to say that I only learned this fact a few months ago. Earlier, I had the misconception that Singapore had only one species of myna, which was introduced. Yet, this is not true. The Javan myna was introduced to Singapore around 1924, while the common myna is native to Singapore (Yap, 2003). In fact, the myna we often observe all around us is the Javan myna. In the 31st Annual Bird Census conducted last year by the Bird Group of the Nature Society (Singapore), the Javan myna was found to be the most abundant. 900 Javan mynas were observed that day, making up 13.4% of all birds detected in the census (Bird Group of the NSS, 2016). On the other hand, house crow was in 11th place with 138 counts, making up approximately 2.05% (Bird Group of the NSS, 2016). Thus, it is evident that the local bird diversity is currently dominated by the Javan myna. The common myna did not even place among the top 20 abundant birds counted in the census. I have always considered both the house crow and the Javan myna as pests. Not only are they not aesthetically pleasing, they are always congregating around hawker centres and pecking away at food scraps left behind on the tables. In other countries, the Javan myna is an agricultural pest, feeding on cultivated fruits and young crops. In Singapore, the main problems it causes are noise, droppings associated with communal roosts and competition with native species. Upon learning in ENV2102 Environmental Law, Policy, Governance & Management that Singapore’s legislation (Statute 5 of the Wild Animals and Birds Act ) legalises the killing of species specified in the Schedule, I actually supported the idea of culling Javan mynas. Other than the Javan myna, five other species have been specified in the Schedule, namely the house crow, the feral pigeon (Columba livia), the purple-backed starling (Sturnus sturninus), the Philippine glossy starling (Aplonis panayensis) and the common myna. My dislike for the species grew when I begin to observe a Javan myna on the ledge right outside my window. It kept coming back day after day, making loud calls frequently. Its calls annoyed me when I was studying and I would try to chase it away. 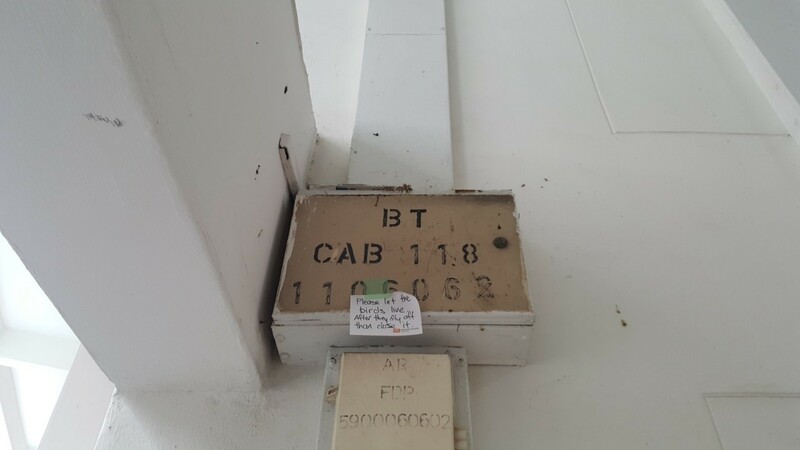 One day, I saw it entering the electrical box (which is not completely covered) at the lift lobby with a twig. I figured the myna must be nesting in there, and that is why it keeps appearing at my window, which is right next to the lift lobby. Just last week, I noticed this handwritten sign by a neighbour on the electrical box. Upon closer inspection, I heard chicks chirping! As I was taking the photograph below, the myna was calling from the nearby ledge, seemingly agitated by my presence and protective of its chicks. 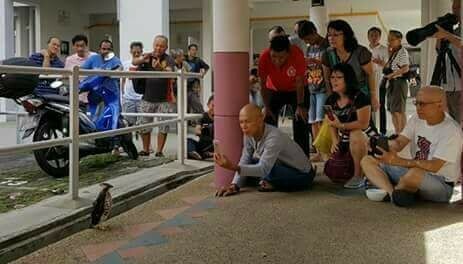 Having always thought that most Singaporeans would share my dislike for the myna, I was surprised that one of my neighbours was compassionate for it. It made me reconsider my dislike for the species. 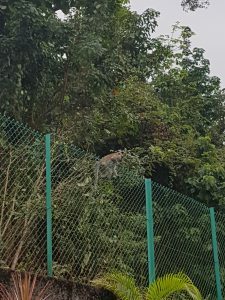 Human-wildlife conflict in urban areas is a prevalent issue in Singapore, with the recent uproar over the culling of local jungle fowls (refer to Lijean’s post to find out more). Being an invasive species, the Javan myna is here to stay. Taking the example of my neighbour, I may not be able to love the species but I think I can slowly learn to coexist with my feathery neighbours. Looking forward to the opportunity to see the adult myna and chicks in action! Brook, B. W., Sodhi, N. S., Soh, M. C. K. & Lim, H. C. (2003). Abundance and Projected Control of Invasive House Crows in Singapore. The Journal of Wildlife Management, 67(4): 808-817. Yap, C. A. M. (2003). 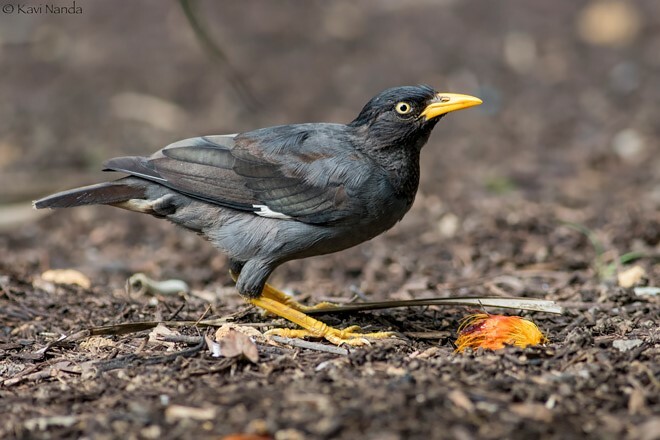 A Study of the Changes in the Range Size of White-vented Mynas in Singapore. The Raffles Bulletin of Zoology, 51(1): 159-163. 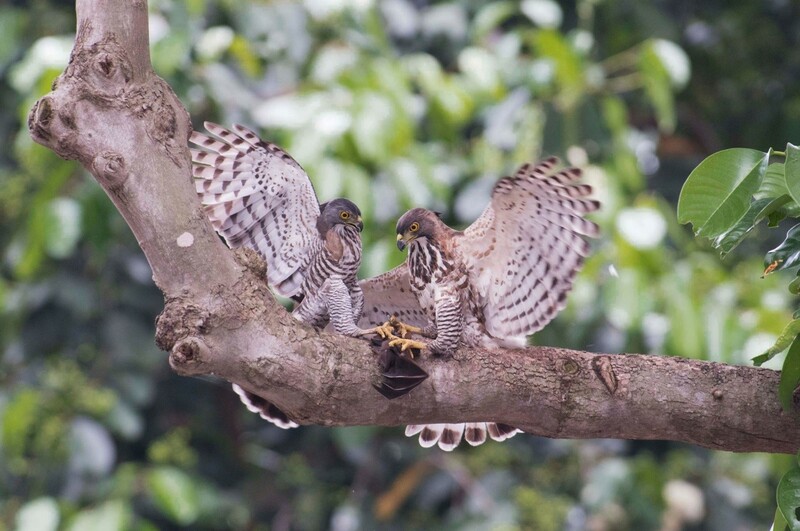 On January 2017, in the heartlands of Bedok, a pair of crested goshawks decided to make a new home for their family. In this blog post, I would like to share a few photos taken by our local nature photographers and also discuss how this bird has managed to thrive in the urban environment. The crested goshawk, Accipiter trivirgatus, is a resident raptor in Singapore with a range that extend from South to Southeast Asia. Growing up to 43 cm, some diagnostic features include a long crest and a buff vent. The Crested Goshawk usually resides and breeds in lowland forests and woodlands. In this urban ecology special, our feathered friends managed to nest successfully in the urban environment in a tall tree adjacent to a HDB right in Bedok North. In order to nest successfully, a few conditions have to be met. One of them is an appropriate nest site. Thanks to our nation-wide urban greenery plan, we see many tall trees in our city, thereby providing refuge and shelter to build a nest. This, along with the many shrubs in the vicinity, ensures that nesting materials can be obtained conveniently and easily. Another condition is a convenient food source for both parents and the chicks. Our urban biodiversity is very much made up of ‘pest’ species like crows, Javan mynas and pigeons. Would these pest birds be an ideal diet for our goshawks? From the photographs taken by our nature photographers above and many more on the Internet, it can be seen that the main diet of these goshawks are Javan mynas and fruit bats. These animals are very common in our urban landscape, possibly increasing hunting success. With such an abundance of food , little threat of predation on both eggs and chicks (the domestic cats couldn’t climb up such a high tree) and nest defence by the parents, the two chicks successfully fledged and were taught to preen and hunt by their parents. As the juveniles were learning to fly for the first time, there were many occasions when they fell to the ground. This caused quite an excitement among the goshawks’ human neighbours as they were able to witness this important moment of a fledging’s life. Many members of the general public would have never seen a crested goshawk before, and to see their life-cycle first hand was indeed a delight! From the photograph below we see the goshawk’s neighbours of all ages curiously fascinated by its presence and yet keeping a distance from it (possibly instructed by our nature photographers). However, with the crowd swarming a single bird, would the young goshawk be heavily stressed out? Hopefully, this successful nesting in the heartlands reminded many Singaporeans that we do have wildlife thriving in our tiny island. 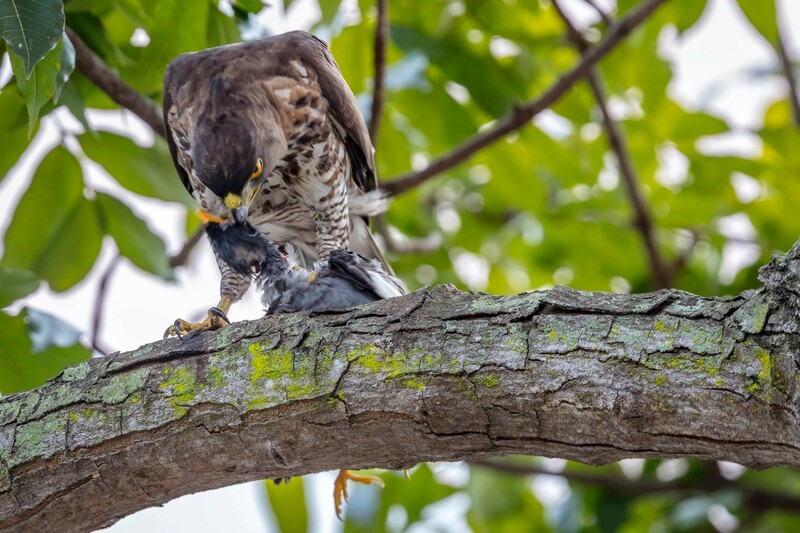 In the case of the goshawks, it shows that wildlife can indeed coexist with people in the urban environment, and breed successfully due to the year-round abundance of prey and low predation risk. I also hope that this nesting event raises awareness about conserving the wildlife we have in Singapore and help us appreciate the existence of natural landscapes even in our heavily urbanised environment. A recent study by Lin et al. 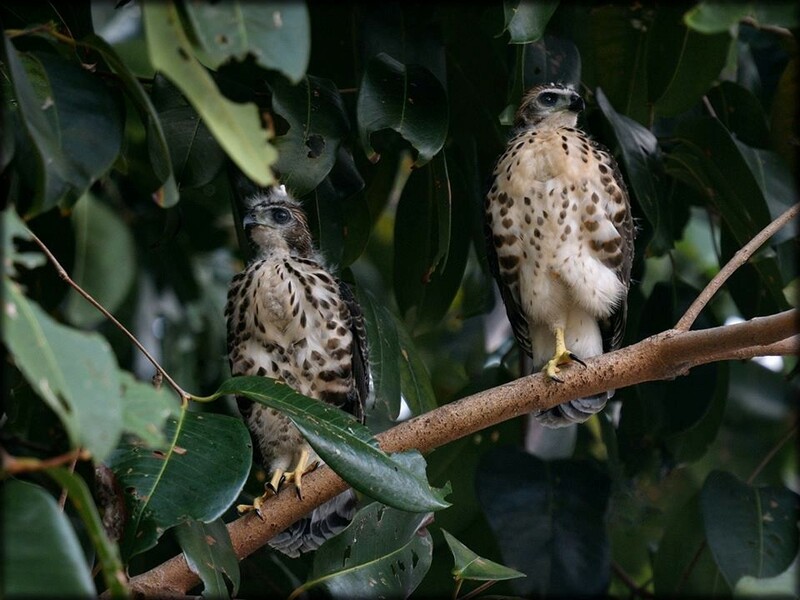 (2015) also found increased breeding success by crested goshawks in the urban environment in Taiwan. Similar to our local goshawks, factors that improve breeding performance include lower predation, high food supply and shelter from inclement weather. They even found that the urban environment advances the goshawks’ breeding schedule, coincidently avoiding the rainy season. The crested goshawk could be adapting fantastically to the new urban environment globally. In last week’s lecture, we learnt about urban biodiversity and how the abiotic urban environments affect some species. The alteration of bird and frog calls in frequency, timing and amplitude makes them susceptible to other threats which include higher risk of predation. This reminded me of the latest “human-wildlife conflict” in Singapore: Free-roaming chickens vs. Sin Ming Residents. The free-roaming chickens were being culled after the Agri-Food & Veterinary Authority of Singapore (AVA) received 20 complaints from the residents (Toh, 2017)- and other reasons such as threat to public health, and the endangered native Red Junglefowl (Tan, 2017). Many debated that the culling of chickens was not clearly justified and actions were taken without much investigation (Toh, 2017). Several people also suggested that the chickens were in fact the Red Junglefowl and that the authorities were simply covering up (Koh, 2017). NParks and AVA refuted back by stating that the Red Junglefowls are KNOWN to occur only in Pulau Ubin and the Western Catchment area and that the differences between a common chicken and the Junglefowl (Tan, 2017). Unfortunately, nothing can be done now to save the chickens. The complaints were likely to be the sentiments of a minority of the residents but we can indeed see how efficient the government agencies were at addressing the complaints. I was reminded of this news as I was considering the likelihood of residents’ complaining the bird and frog species which alter their calls in order to adapt to urban environment. Should the consequences of alteration of calls include human removal then? (This might sound silly to you but I am just considering the possibility of it happening). However, the fact that we humans decide the survival of the animals with just a complaint shows how powerful we are as a driver in shaping the urban wildlife community. Additionally, the authorities should not simply assumed that the Red Junglefowl occur only in several areas. Sin Ming is very near to the Catchment. There is indeed a possibility that the chickens were the Red Junglefowl! More investigation is needed when addressing such complaints about the animals and the welfare of the animals should be of equal priority. If the chickens were indeed the endangered species, can we trust the authorities in fostering and safeguard urban biodiversity? In my opinion, the culling of the free-roaming chickens simply promotes the residents’ intolerance to animals’ presence in the urban area. This will perhaps have implications on the fostering urban wildlife. The free-roaming chickens had lived in the area for decades but were still culled. What can we expect as encroachment to nature areas increase which increases the chances of people encountering more unusual wildlife?? The presence of the free-roaming chickens could or should be used as a material to educate the public of the way to co-exist with urban animals. The public should be guided to accept the presence of urban wildlife. This is especially so when Singapore is an urban jungle and many of us do not frequently connect and interact with nature. Although many were against of the culling, many suggested relocating the chickens instead. This shows that people who are in favour of protecting the wildlife may not necessary be open to sharing spaces with them. This is a huge obstacle in urban biodiversity conservation. Tan, A. (2017, February 2). Free-ranging chickens may be culled. The Straits Times.